It’s that time of year again – car-buying season. Getting into the spirit – and just in time for holiday shopping – Cars.com has named its Best of 2015 car nominees and Best Pickup Truck of 2015 nominees, 12 vehicles from nine automakers. The website also named nominees in eco-friendly car, family car, luxury car and play car categories. Nominees for the top car, in alphabetical order, are: BMW M4, best new luxury sport coupe; Dodge Challenger, best new sports car; Honda Fit, best new subcompact car; Mercedes-Benz C-Class, best new compact luxury car; Subaru Outback, best new wagon, and Volkswagen Golf, best new compact car. Truck nominees for 2015, also in alphabetical order, are: Chevrolet Colorado, Ford F-150 and Super Duty F-250-350, GMC Sierra 2500/3500, Toyota Tacoma and Toyota Tundra. Eco-friendly car – Chevrolet Volt, Honda Accord Hybrid and Volkswagen Passat TDI. Family car – Dodge Durango, Hyundai Santa Fe and the Santa Fe Sport. Luxury car – Audi A7, Land Rover Range Rover and Volvo XC60. Play car – Mazda MX-5 Miata, Land Rover Range Rover and Porsche 911. 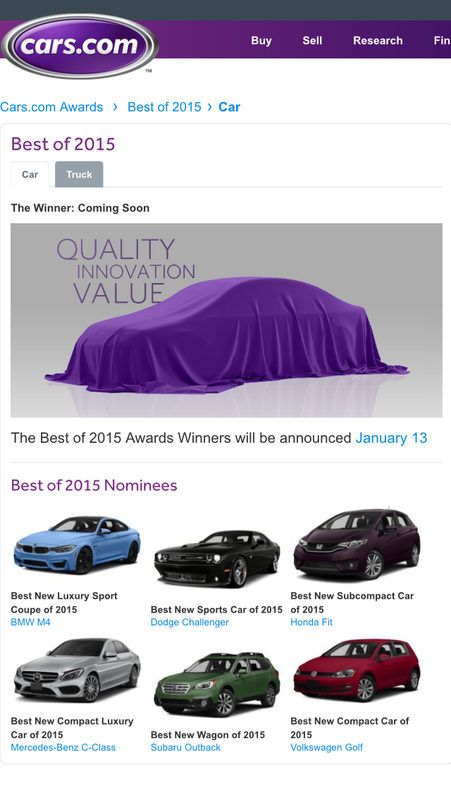 Cars.com also named Shoppers’ Choice Award nominees, which the website decides “best represent the voice of our shoppers” from site visits, searches, shopper reviews and other criteria. Those 10 nominees, also in alphabetical order, and including their categories, are: Chevrolet Silverado 1500, pickup truck; Dodge Durango, SUV/crossover; Ford F-150, pickup truck; Ford Mustang, sports car; Honda CR-V, SUV/crossover; Honda Odyssey, minivan; Jeep Wrangler, SUV/crossover; Mazda Mazda 3, compact car; Toyota Corolla, compact car, and Toyota Prius, green car/hybrids. Winners of the Cars.com awards will be announced Jan. 13, 2015, at an event during the North American International Auto Show in Detroit, MI. But you don’t have to wait that long to make your own choice.